This evening I made a quick and easy dinner by using a bag of my favorite "7 Superfood Salad" blend made with kale, brussels sprouts and a number of other veggies. I topped with the Chipotle Grilled Chicken Cutlets I made a couple of nights ago (chicken cutlets spritzed with olive oil and seasoned with chipotle seasoning before grilling). I cooked the cutlets alongside the Bacon Double Cheeseburgers I made so I could cook a couple of meals at once. 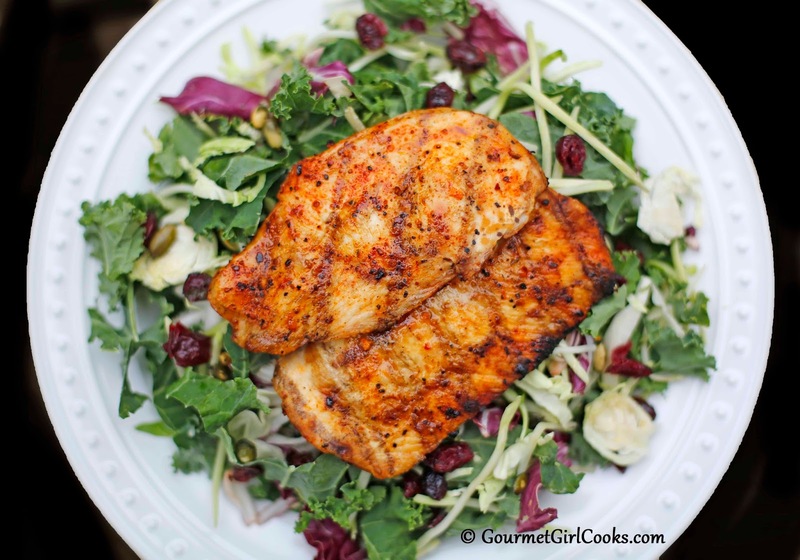 I grilled enough chicken cutlets to enjoy grilled chicken sandwiches last night and for the delicious and quick salads this evening. I will say, though, that tonight would have been a much better night for soup considering we didn't get above 55 degrees here today! It was quite chilly to say the least after the unusual heat wave we experienced just days ago. We have rain in our forecast throughout the week. I snapped a quick photo of our delicious salads below. Eating low carb "real food" can be as easy as you want or need it to be and you don't have to cook every single night to "keep it real." Enjoy! YUM!!!! Such a nice looking meal. Yes, soup weather. I will be making chicken and noodle soup tomorrow. My husband loves it with brown rice or noodles.